Handmade in Florence, Italy, the Nesti Dante Soap Collections pay homage to breathtaking Italian landscapes. Nesti Dante soaps are created with the age-old method of saponification, which ensures each soap is luxuriously rich, intensely soft on the skin and subtly scented throughout. 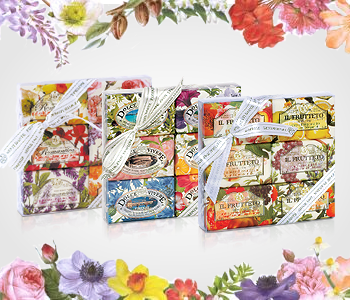 The extravagant soaps are made with natural, 100% biodegradable ingredients and presented in elegant Florentine style paper, for a truly unique and exquisite cleansing experience that will take you on an enchanting tour of Italy.